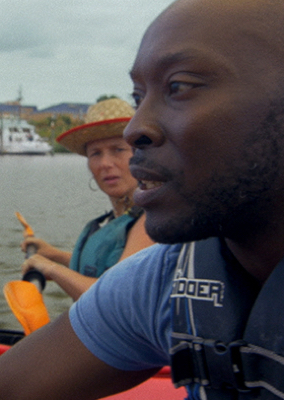 All Against the Sea is an atmospheric short film about a hopeful husband who takes his troubled wife on a formidable kayaking trip, as what goes unsaid threatens to drown them. Filmmaker Michael Sládek's feature-length films include Con Artist, BAM150, and Devils Are Dreaming. Via his Brooklyn-based Plug Ugly Films, he has made numerous web series, shorts, commercials, branded content, industrials, and music videos, including We Live On Your Street, which won Jury and Anarchy Awards at Slamdance Film Festival. Also a theater director, Sládek is a 2013 Acker Award recipient and is currently developing the features Jew Boy and The Phantom Limbs of the Rollow Sisters while serving as the NY Consultant for SAGindie.